Komfy Kings has been a trusted furniture manufacturer for over 15 years and they�re best known for their top quality gliders and recliners. Their seats are perfect for any room in the home and especially great for a baby�s nursery. 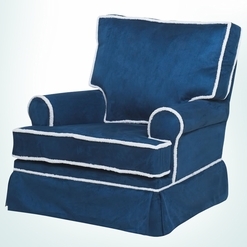 They design each glider and recliner with top quality construction and hardy, beautiful finishes. The cushions are all very plush and easy to clean. Their gliders and recliners also allow you to rock, glide and swivel 360 degrees, making it the type of chair that everyone in your family will love.